David Soper was born and raised in the Chicago land area, and currently resides in the suburbs with his wife and two children. Dave is a veteran of the financial services industry and enjoys educating & equipping his clients with the necessary information to navigate both Bull & Bear markets. He earned his Bachelors Degree in Accounting from Loyola University of Chicago. Dave currently holds multiple securities registrations including the Series 6, 7, 63, and 65. 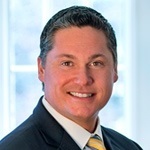 He is a Managing Partner at Northpoint Financial Group, an Investment Advisor Representative at Woodbury Financial Services, Inc., and holds the Registered Financial Consultant designation. Dave holds his Life, Health, AD&D, and Long-Term Care Insurance licenses. Dave travels extensively for his clients in order to provide financial & retirement planning for busy professionals, families, Taft-Hartley organizations, & many of America’s largest corporations.